This summer's theme is "Summer, A Great Opportunity for Improvement!!" Week 1 is focusing on practicing. So the title of our first video is "Your Practice Sessions." It Takes the Right Attitude To Get the Altitude! If you think of yourself as the pilot of your improvement, you will quickly see that your attitude plays a key role in your height or altitude of progress. The A.R.T. of someone really serious about growth in any field needs the qualities of Application, Regularity and Targeting. If you want good retention, have immediate application on a regular basis. This will increase your awareness, and your ability to reapproach and fine tune your results. One obstacle to steady progress is thinking it should happen in a straight line. For actual development to happen it really is necessary for things to go a bit up, down and sideways from time to time so we can get different insights and learn a variety of lessons. Another obstacle is not spending enough time with just a couple of things. Taking on too much can put us on overload making it difficult to process our information clearly and effectively. Let's say you have forty minutes to practice. You might need five or more minutes to get yourself in a better more clearly focused state of mind and another five or so minutes of horn warm-up time. So now you could have 25 or minutes left for some excellent concentrated time to work on a passage that is giving you a challenge, or play through a couple of excerpts all the way like a mini audition round or work an any area of playing like articulation, slurs, range building, dynamic contrasts. etc. Remember that you can strain your embouchure in these 25 minutes if you are not thoughtful. Twenty-five minutes of loud high range can really be harmful for some people. You might want to take that twenty-five minutes and play some low range then mid range and then go to some high range playing ending with some low range playing again. In working on the three step assignment, do some breathing exercises first, followed by some simple mouthpiece glissing in a comfortable range for a minute or two then go to your exercise or piece of your choice. Blowing air on your palm to feel that air pressure is great. I always imagine a micro-cresendo while the air is being blown on my palm as well as thru the trombone. It is so easy to sag which means we are losing our mental focus and intention as well as air support weakening. To become conscious of our mental support, I practice the finger on the palm as shown in the video. Here it is important to practice a micro-increase of pressure for maybe thirty seconds or so to give yourself the discipline of slow but steady pressure and mental focus. Support means not dropping the ball! It can be done in a way that's not full of tension but is held in a stable and balanced way. In order to get the altitude, we need a supportive and grounded attitude! You can have the greatest methods in the world, but with an unsupportive attitude it will not happen or take you much longer to achieve what you would like. Remember it is the balance between allowance and resistance. Have standards but give yourself the chance to achieve them! I hope this writing gives some extra clarity to the video. If you have any questions put them on the comment page and I will answer them. Frequency Bone Summer Music Connection 2 Starts Next Week! In the spring, many high school and college students are hoping to get into summer music festivals or music camps. Perhaps a seminar or two. Some even apply to work at these festivals so they can at least be around the excitement that being a part of all the rehearsing, concerts, listening to lots of talented people practicing and new friendships bring. But what if it is our situation that we did not get into a summer music festival or could not afford to go to one? What can we do to make the most of our time and see tangible progress in our playing during this time? The answer is a ton! So for this year's Frequency Bone Summer Music Connection (FBSMC), we are going to focus on improvement methods and techniques in many areas of playing and music making. Let's face it, with the aid of a computer, there is so much a person can do. In fact without a computer there is an infinite number of things one can do! There is always something that can be done. So with the inspiration of that fact, let's call Frequency Bone Summer Music Connection 2, "Summer, A Great Opportunity For Improvement!" The FBSMC online music camp will start Monday the 27th of June and go until about July 30th. It might go longer but we'll play it by ear and response. This year the format for the FBSMC will be a bit different. There will be one topic per week which will include a video and a writing or two. So in a way, it will be more like weekly sessions, giving the interested person time to work on, think about, practice and experiment with the material that will be offered. More time to digest and prepare for the next weekly session is the idea behind this format. *There Is Always Another Way or You're Not Bored Are You? 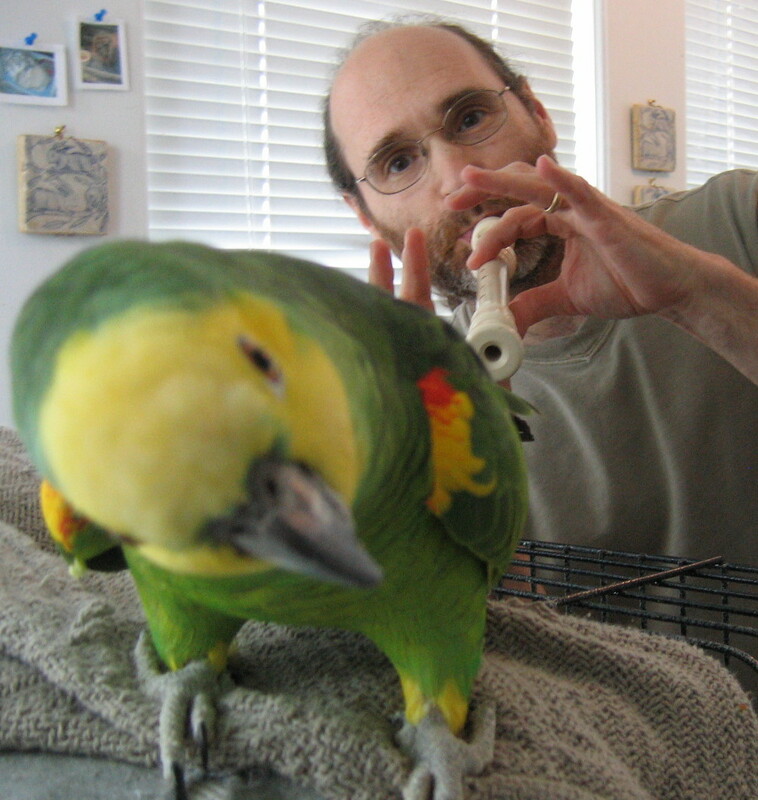 *Embouchure and Air, Is It A Good Marriage? *Articulation or Air-ticulation? That is the Discovery! *Range Building- Muscle or Technique? *Expect the Unexpected But Don't Count On It! In these sessions there will be many practical exercises for you to practice and work with. There will also be weekly 'assignments' for the interested. I look forward to working with you all this summer and if you are one of the ones who are at a music festival already, feel free to join in. Some of this material may not be covered in your program! Or at the very least it will offer another approach. 'See' you all next week!! Not Music Does This Make! What about this word translucent? That seems to stick out a bit. How would one go about practicing it? What is meant by translucent here is the ability to blend in with anything so you do not 'disturb' the blend or ensemble. It is the ability of doing what needs to be done and no more than that. No rough edges, no 'risky' chances, and the ability to hide or disguise your weaknesses. It is practical and safe advice if you are a last minute sub for someone on a heavy concert. It might be a somewhat useful strategy for a freelancer as well at times. Interesting that the uniform of the orchestra is black and white just like a keyboard. And basically a person is auditioning to be a key on the orchestral keyboard. The orchestral uniform in brass playing right now is getting to be a one size fits all in terms of musical content. To want a uniform sound has its merits but not all music can fit into that confinement. Orchestral players can be so obsessed with evenness of sound they can miss the spirit of the music. Decibel levels are not the only means of color change. The biggest change comes when there is an actual character or frequency change. Then the change is on the level of vibration and sentiment. Finding things on the level of technique only works with a limited part of the human instrument and can never be a replacement for connection to the essence. Repetition is a very powerful tool. Almost everything has an element of repetition. What is practicing? It is doing things over and over again until it becomes 'second' nature, second nature means it is in our programming and our automatic systems repeat it. BUT, depending on how we practice, we also put our attitudes, emotional states and physical qualities into the programming as well. Most people have had the experience of reading a book or seeing a movie more than once. Isn't it amazing the things we pick and notice after a second viewing or reading? Same things happen when listening to music over and over again. And with thoughtful practice we can put together and develop other qualities. Even the development of muscular strength happens with repetition. The challenge is to not let the the repeated efforts get so automatic in the practice room that they become unconscious. I know people who are like orchestral excerpt vending machines. Put in a quarter, and out comes a nice prepackaged excerpt. The problem in my view is it can sound stale or out of date meaning past the fresh stage. Out of date, that is an interesting one. That can get into current fashion, the orchestral uniform of any given era. If a person does want an orchestral job, they need to fit into that uniform. Is it possible to wear the uniform but still put the soul of oneself into it somehow? That would be what I would suggest. Then you don't totally sell your soul. I can just imagine the great Jedi master Yoda saying, "Good intonation, rhythm and control, not music does this make!" Is the 'Force' with you when you play?